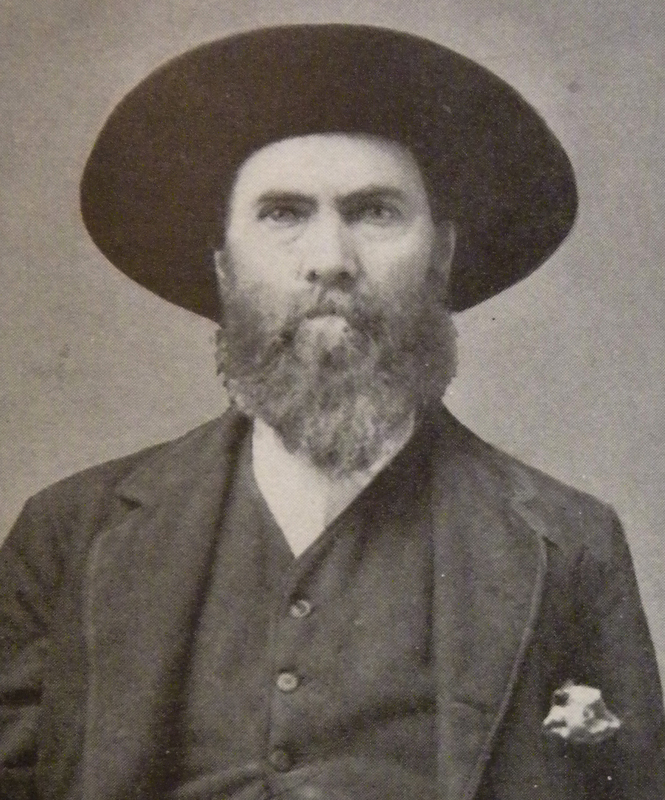 Andrew Jackson Corley (crop of photo from page 186 1/2, A Genealogy of Corleys by Dewitt C. Corley (1927)). What a wealth of information! After looking up his Civil War records, I found the pension information for the applications filed by him and his second wife, so I need to try and find that the next time I’m at NARA. His second wife was Sarah Jane Wooters, whom he married shortly after Harriet’s death around 1872. He died 5 September 1893. Thanks to A Genealogy of Corleys, I have a picture of Benjamin and Lois. July 12 also is the anniversary of the death of my grandmother Ida Bole (Hill) Corley in 1943. I’ve written about the Hills extensively. I haven’t spent a lot of time on this line and I haven’t been able to identify her parents yet. “1) Determine who is one of the most prolific fathers in your genealogy database or in your ancestry. By prolific, I mean the one who fathered the most children. I’m lucky to know quite a bit about Jonathan thanks to my copy of A Genealogy of Corleys. Jonathan was a blacksmith born in Bedford County, Va., in or around 1783. He moved with his growing brood to Kentucky before settling in Shelby County, Ill. In A Genealogy of Corleys, the author relates that Jonathan went by the nickname Grandser (probably a contraction of Grand Sire, according to the author — how appropriate!). He served as a justice of the peace and apparently performed quite a few marriages in Shelby County (I need to make a note to look for records of this!). “Mr. Corley lived in the time when there was little opportunity for education, and while he was as stated, a Justice of the Peace, which shows that he was able to read and write and keep records, doubtless this was done in somewhat primitive style. Yet, this renders it all the more strange that he left no fuller account of himself and his father [Caniel Corley]. It was reputed that he kept a family record, but after his second marriage [to Elizabeth DAVIS, which produced no more children], if such a record ever existed, it passed out of the hands of his children and has not been recovered.” (pages 8-9). Jonathan died 30 October 1861 and is buried with Delilah in a Corley family cemetery in Shelby County, Ill.
A Genealogy of Corleys was written in the 1920s and I’m hoping that with today’s increased availability of resources, I may someday have more luck finding information about Jonathan. I finally had a chance to do some personal genealogy research last night and so I headed to Ancestry.com to look for tidbits. 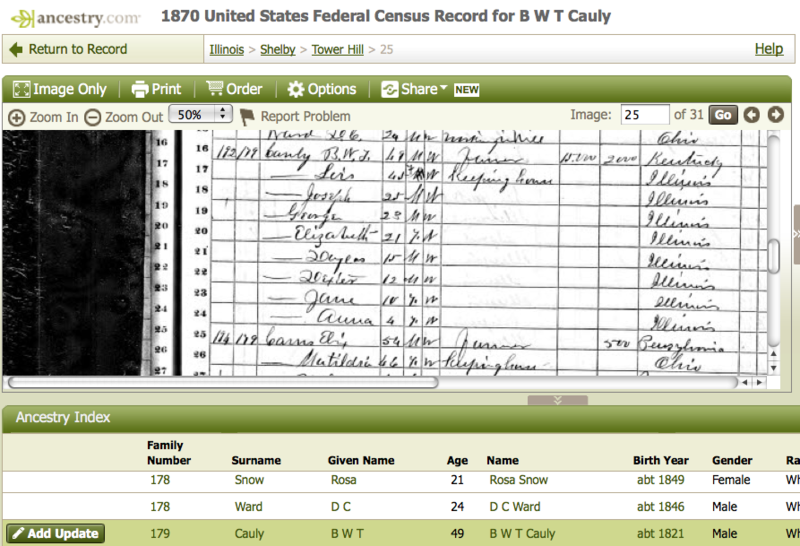 While researching my paternal line, I found Benjamin William Franklin CORLEY (my great-great-grandfather) and fam in the 1880 and 1860 censuses in Tower Hill, Shelby Co., Ill., but had no luck finding them in 1870. I was relatively sure that they hadn’t left the area only to return again before 1880. I decided to look for one of my ancestors’ neighbors in 1870 instead and then check the nearby pages to see if my fam turned up. I went back to the 1880 census and looked to see who their neighbors were that year. 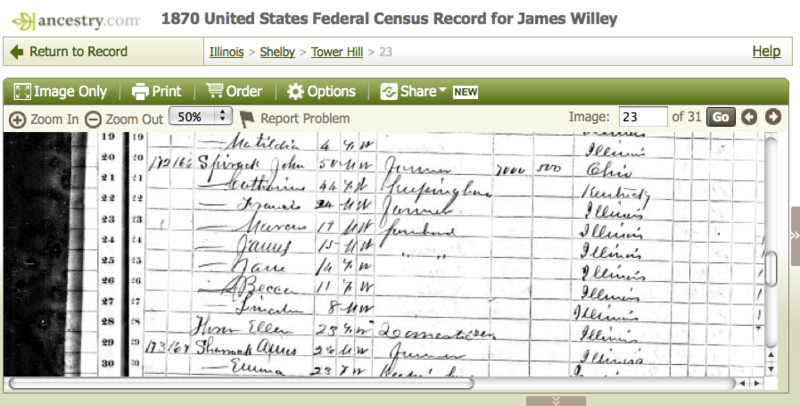 A NICHOLS family was the next on the census sheet. That’s a rather common name. Next was John SHARROCK. Perfect! Benjamin William Franklin Corley and fam in 1880. John Sharrock is two households down. Click on the image for a larger version. I searched for John Sharrock in the 1870 census and was able to find him in the same town and county. The censustaker there that year seemed to have some creative spelling ideas and his handwriting left quite a bit to be desired. No wonder I was having trouble finding my family! The censustaker wrote “Spirock.” His handwriting/spelling left a bit to be desired. I scanned a couple of pages back and forth and then found what I was looking for (sort of). Due to his lengthy name, Benjamin William Franklin Corley often appears as B.W.F. Corley in various records. Well, I found what looked to me like a B.W.F. CANBY, but was indexed as CAULY two pages past Mr. Sharrock/Spirock. 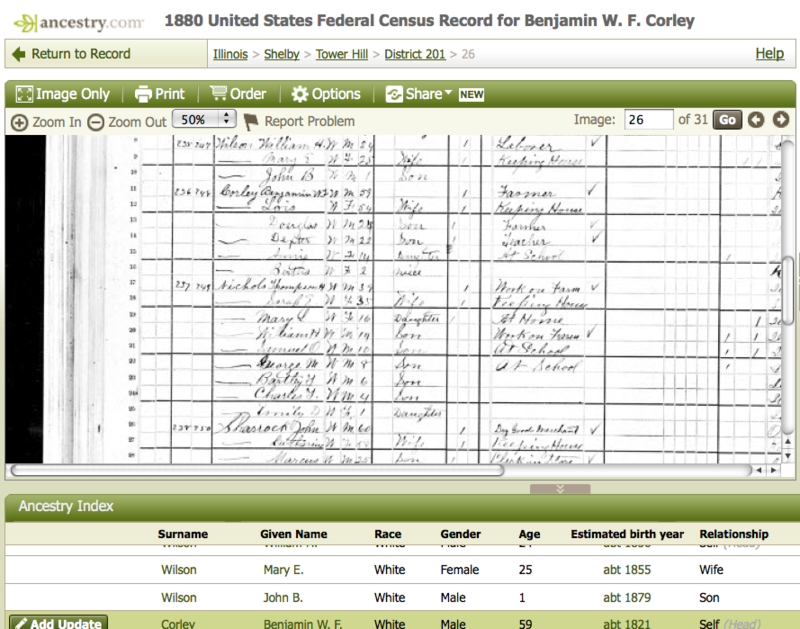 Below the scan of the image on Ancestry is a typed index of the information appearing on the page. In the bottom left-hand corner is an “Add Update” button. 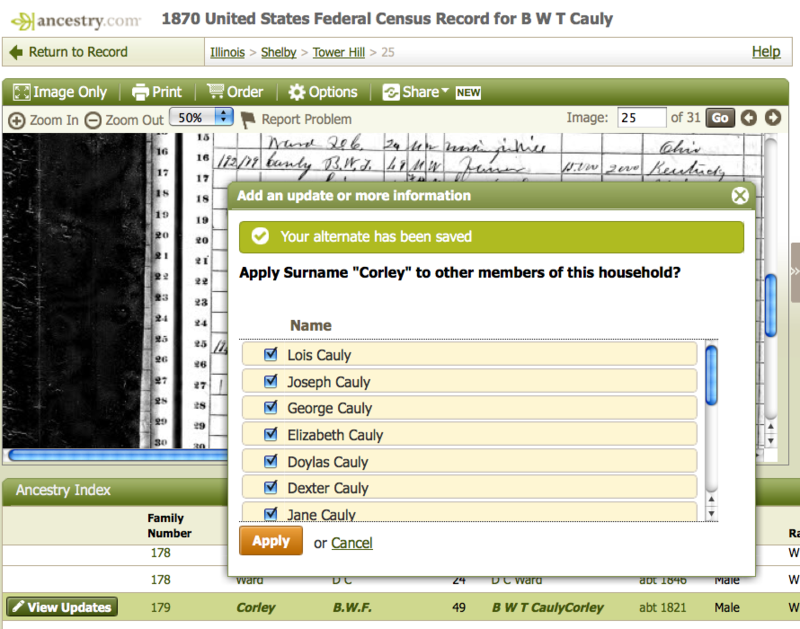 I clicked on this to update the spelling of the household surname in the census index. Any index is going to have inaccuracies, especially one that is based on sloppy handwriting and questionable spelling. I’m glad to see this feature on Ancestry that allows for researchers to help contribute to making the index more accurate!